Native to Michigan, Ohio, and Kentucky. Introduced as fishing bait and aquarium pets across the United States. This is a medium- to large-sized freshwater crustacean. It is native to Michigan, Ohio, and Kentucky. It is used extensively by fishermen as bait, and is sold as an aquarium pet. It has been introduced across the United States as unused bait and released aquarium pets. It is now found from Manitoba to Quebec in the north to Tennessee and North Carolina in the south, with disjunct populations in New Mexico and Oregon. There are large populations in many states, including Minnesota. It is considered invasive outside of its native range. Adults are about 1¾″ long when the reach maturity at one year of age. They live three or four years and continue to grow, molting at least twice a year, eventually reaching up to 4″ in length not including the claws. The legs, abdomen, and shield (carapace) covering the front part of the body (cephalothorax) are variable in color. They may be greenish-gray, reddish-brown, or tan. There is usually a rust-colored, thumbprint-like mark on each side of the carapace, and a rust-colored stripe on the upper (dorsal) side of the abdomen. The rust-colored markings may not be present on any individuals in some locations. The long spike-like extension of the carapace that projects forward between the eyes (rostrum) has slightly concave sides. The claws (chelae) are up to 4″ long. They are larger and more robust than those of any other Orconectes species. They often have black bands at the tip. The movable finger (dactylus) on the claw has an S-shaped margin. The gap on the claws when closed is oval. Omnivorous and opportunistic. 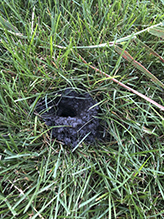 Mostly decomposing organic matter (detritus), but also aquatic plants, animals (especially snails), and insects; other aquatic crustaceans; algae; and fish eggs. Breeding takes place in September and October. Eggs are laid in April and May. Juveniles have a higher metabolic rate, eat twice as much, and develop much faster than native crayfish species of similar size. They are active in daylight. They are extremely aggressive, out-competing and eliminating other crayfish species when introduced into a new site. Distribution Sources: 22, 24, 29, 30. Crayfish or Crawfish? The taxonomically correct term for members of the superfamilies Astacoidea and Parastacoidea is crayfish. "Crawfish" is a southern dialectical variant of that word. It is commonly used in the United States and is accepted American English, but it is not used outside the United States. 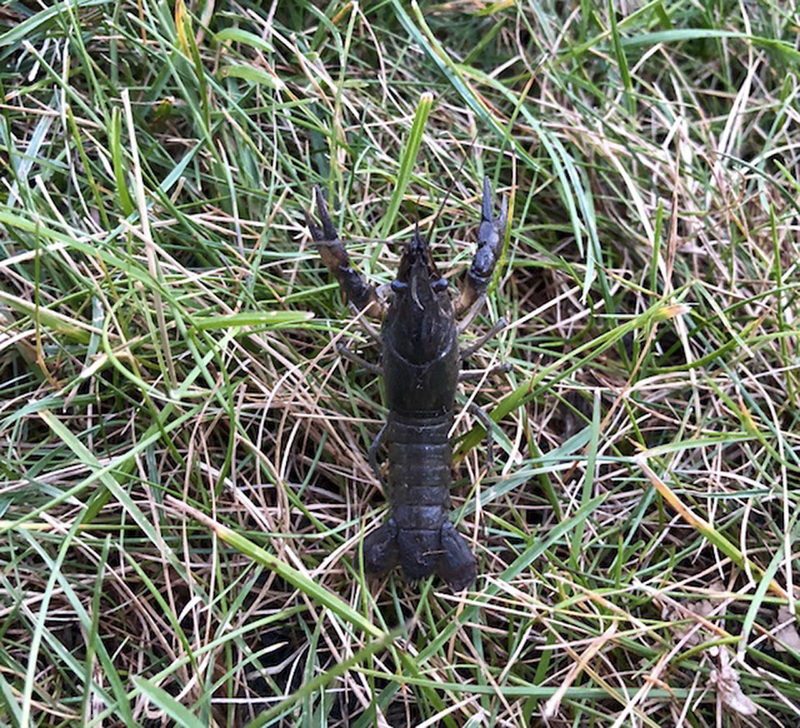 Young rusty crawfish found near chimney that they produce. 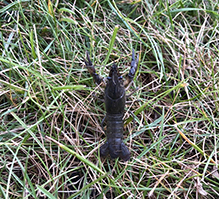 ID based upon MN pollution control sight and larger exoskeletons found regularly nearby. Larger live specimens have been found a few years back. 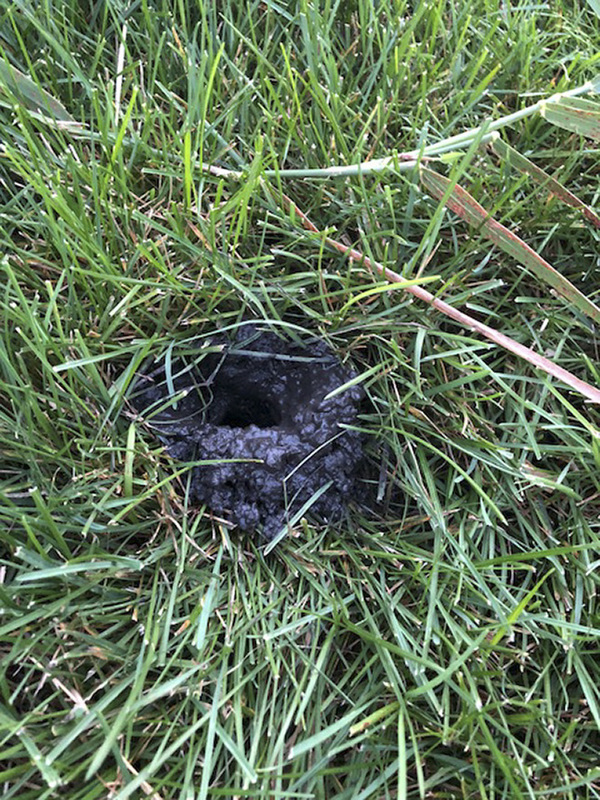 This one was about 2.5-3 inches long. #1 Wildlife Documentary Series of Amazing Wildlife in Minnesota. This video is great for 3D Animators to do a walk cycle animation. Use this footage as a background in 3DS Max, ect. 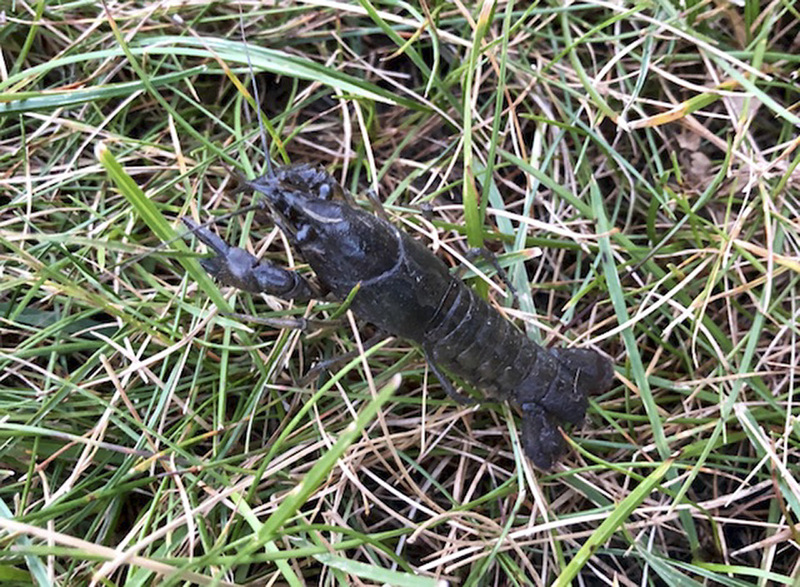 Vince Patton of "Oregon Field Guide" reports on the threat posed to waterways by the eastern crayfish, a species native to the Ohio River that can now be found in 18 states and two Canadian provinces. "Oregon Field Guide" is a production of Oregon Public Broadcasting. Filmed with underwater camera in the Little Miami River. Possibly the first time a mass migration of crayfish has ever been filmed - under and above water! 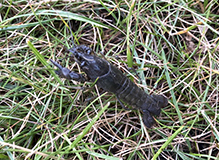 The invasive Rusty Crayfish Orconectes rusticus, has hybridized with a native Ontario species, Orconectes propinquus, and in several generations has evolved an overwhelming drive - an obsession - to migrate upstream. In the face of all odds, this crayfish is a compulsive pioneer! University of Notre Dame graduate student, Lindsey Sargent, explains the tell-tale sign that you're holding an invasive rusty crayfish.